This inexpensive 12V volt AC/DC switching power supply adapter is useful for any application requiring UL/cUL approved 12 volts at 3 amps or less with a car cigar lighter output. 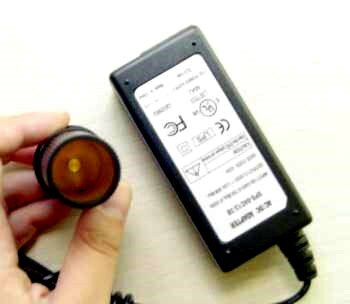 Useful for powering car accessories from the house AC mains in any country. Optional cord with cigarette lighter plug and 5.5 x 2.1 mm barrel connector. Model : PST-04C12 Name : AC power to cigarette lighter 12V DC Switching Power Supply for Cooler, Car Appliances, bottle warmers and other applications. Inexpensive switchmode AC switching power supply with automobile power point socket. 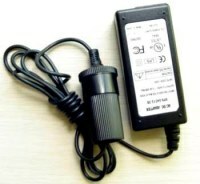 Adapter 120 VAC to 12 volt DC with cigarette output.